At the very beginning of the history of the covenant idea, human beings were conceived as entering into a morally grounded and informal pact with God. Politically, this pact, or covenant, involves the coming together of basically equal humans who consent with one another through a morally binding pact, setting the partners on the road to a new task. As a theological and political concept, covenant is designed to keep the peace in the face of conflicting human interests, needs, and demands. This pioneering continuation of Daniel J. Elazar's work is concerned with political uses of the idea of covenant and the political arrangements that flow from it. 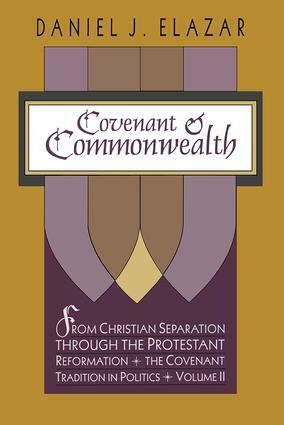 Covenant and Commonwealth is the second in a series of volumes exploring the covenantal tradition in Western politics. The first, Covenant and Polity in Biblical Israel, analyzed how the Bible set forth ideas of covenant in ancient Israel and the Jewish political tradition. In this volume, those themes are taken a step further to examine covenant as a political idea and tradition along with the culture and behavior that they produced. The book focuses on the struggle in Europe to produce a Christian covenantal commonwealth, a struggle that climaxed in the Reformed Protestantism of the sixteenth and seventeenth centuries. It also briefly examines covenant and hierarchy in Islam and other premodern polities that shape our present. The third volume in this series will examine the progressive secularization of the covenant idea in the seventeenth and eighteenth centuries. Covenant and Commonwealth is a fundamental and original contribution to the scholarship of Western civilization. It ranks with commensurate efforts of Ferdinand Braudel and Joseph Needham. As such it will be of deep interest to historians, social scientists, and theologians of all persuasions.